Maybe the constant increases in hard disk capacity provide us with more space we can waste with our files, but there is always a situation in which we would like to squeeze as much data in as little space as possible. Besides, it is always a good practice to keep disk usage as low as possible, just for tidiness. The first and most important advice for saving space: for $GOD's sake, delete the stuff you don't need! Now, assuming you want to keep all you presently have, the second tool is data compression. Linux users have long time friends in the gzip and bzip2 commands. One would use the former for fast (and reasonably good) compression, and the latter for when saving space is really vital (although bzip2 is really slow). A more recent entry in the "perfect compression tool" contest would be Lempel-Ziv-Markov chain algorithm (LZMA). This one can compress even more than bzip2, being usually faster (although never as fast as gzip). We can use zcat, zgrep and zdiff as replacements for cat, grep and diff, but for gzipped files. These account for a huge fraction of all the interaction I do with text files from the command line. If you are like me, they can save you tons of time. Vim can be instructed to open some files making use of some decompression tool, to show the contents of the file and work on them transparently. Once we :wq out of the file, we will get the original compressed file. The speed to do this cycle is incredibly fast: almost as fast as opening the uncompressed file, and nowhere near as slow as gunzipping, viming and gzipping sequentially.
" After reading compressed file: Uncompress text in buffer with "cmd"
" After writing compressed file: Compress written file with "cmd"
execute "!" . a:cmd . " :r"
" Before appending to compressed file: Uncompress file with "cmd"
execute "!" . a:cmd . " "
I first found the above in my (default) .vimrc file, allowing gzipped and bzipped files to be edited. I added the "support" for LZMAed files quite trivially, as can be seen in the lines containign "lz" in the code above (I use .lz as termination for LZMAed files, instead of the default .lzma. See man lzma for more info). Other files that I have been able to successfully use in compressed form are PostScript and PDF. Granted, PDFs are already quite compact, but sometimes gzipping them saves space. In general, PS and EPS files save a lot of space by gzipping. As far as I have tried, the Evince document viewer can read gzipped PS, EPS and PDF files with no problem (probably DVI files as well). Actually it is two applications I want to highlight: Filelight and Baobab. 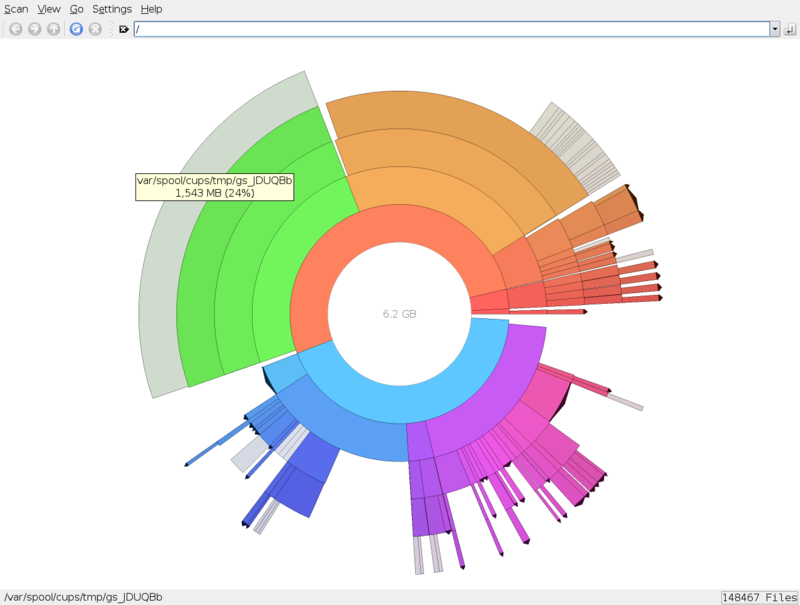 Both are disk usage analyzers, the former for KDE (see Figure 1), and the latter for GNOME (see Figure 2). A disk usage analyzer is a tool to conveniently find out how much hard disk space different directories and files are taking up. It combines the effectiveness of the Unix du (if you never used it, stop here and do a man du in your command line immediately. If you do not know what that "command line" thingie is, whip yourself in the back repeatedly), with the convenience of a visual clue of how large directories are compared to one another. 1 - When I want to open a terminal in a location chosen from the DUA window, with Baobab it's two clicks away: "Open file manager here", then "Open terminal here" in the file manager. With Filelight, it's just one click: "open terminal here". Plus Filelight has a handy locator bar at the top, showing the full path to the current location (useful to copy-and-paste with the mouse to an already open terminal). 2 - Filelight shows directories up to individual files. Baobab just dirs. 3 - With Filelight, navigation up and down (and back and forward) in the dir tree is a breeze (web browser-style). With Baobab, it's a pain. 4 - The presentation is similar, but the one of Filelight is slightly nicer, with more info when the mouse is hovered over the graph. Probably Baobab can be easily made to behave like Filelight. I just tried them both, and liked the latter better on first sight. I tried Baobab first, and I found some things lacking. When I tried Filelight, five minutes later, I just thought "These are the details Baobab was missing!"